This post and hopefully the next few will be about an El Cid project a friend and I have worked on for almost two years. 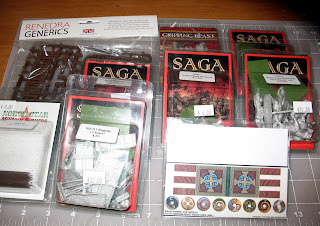 At various points we wrote our own rules, used other established rules systems, and now might try to get these into our SAGA games. 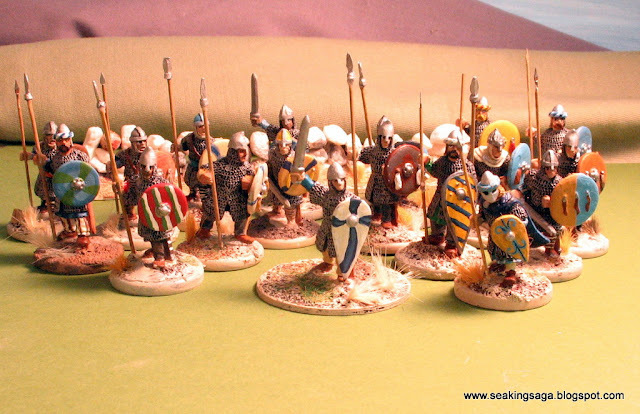 I volunteered to paint a big chunk of his figures and he wanted them to represent a Portuguese force. Properly defined however, there was no Portugal in the mid to late eleventh century, the era of the Cid and the rise of Castile and Leon. Though Portugal was not recognized as a sovereign kingdom until 1143, the political separation of the western lands of the Iberian peninsula has a long history. It was organized under the Romans as the province of Lusitania. Following the Roman era, the Suevi tribes controlled western and northwestern Iberian lands until their absorption into the Visigothic kingdom. The collapse of the Visigoths against the Arab invasion in 711 put most of the Iberian peninsula in Umayaad control. A small portion of the northwest, Asturia, was the refuge of the Visigothic nobility and the Basques controlled the mountainous northwest. Under the Asturian king Alfonso III, western territory was recaptured in 843 and the settlement of Porto Cale was established where the Duro River met the Atlantic. As a buffer zone between Galicia and Al’ Andalus, Alfonso awarded it to his vassal Vimar Peres. The ninth and tenth centuries were the golden age of the Cordoban Caliphate. Andalusia was the wealthiest and most sophisticated power in western Europe and though Islamic, attracted Christians eager to study medicine, science and work as mercenaries. The height of this power was reached under the vizier Al-mansur (Almanzor, 938-1002). He waged war on Castile and Leon, raiding as far as Santiago. After 1031, the political balance shifted decisively towards the Christian kingdoms. In that year, the last Cordoban caliph was removed and Andalusia was divided into numerous rival taifa kingdoms. Meanwhile, the Christian kingdoms were consolidating under King Fernando the Great. In the west, Fernando was campaigning well below the Tagus River on the Muslim held city of Badajoz. As Christian held land expanded around Porto, the County of Portugal was formed. The Christian armies at this time were not actively looking to reclaim the peninsula for the extraction of tribute payment, paria, was much more lucrative than conquest. Throughout the tenth century, the County of Portugal remained more or less a part of the Kingdom of Leon. The death of Ferdinand in 1065 resulted in the division of his kingdom into three parts. His eldest son, Sancho, received Castile; Alfonso, the favorite, received the heartland of Leon; and the youngest son Garcia was granted Galicia, which included the County of Portugal. In 1070, Count Nuno Mendes, a decendant of Vimar Peres, rebelled against Garcia and was defeated in 1071 at the Battle of Pedroso. Thereafter, Garcia took the title King of Galicia and Portugal, the first to refer to it as a kingdom. Ferdinand's lands were not divided for long. In 1071, the two eldest sons attacked and divided attacked and divided Galicia, with some sources claiming that Sancho's alfarez Rodrigo Diaz personally captured Garcia. A year later, Sancho was dead, murdered by unknown assassins and Alfonso VI was king of Leon, Castile and Galicia. As for the county of Portugal, Alfonso named his son-in-law Henry, brother of the Duke of Burgundy, as count. Alfonso death at age 72 in 1109 after more than forty years on the throne was the catalyst for Portuguese independence. Succession was an open question. With only surviving daughters, the eldest, Urraca was widowed but with a male child. Her sister Theresa and brother in law Count Henry were far from obedient vassals. Their child, Afonso, was finally proclaimed King of Portugal and captured Lisbon with English crusaders in 1147. 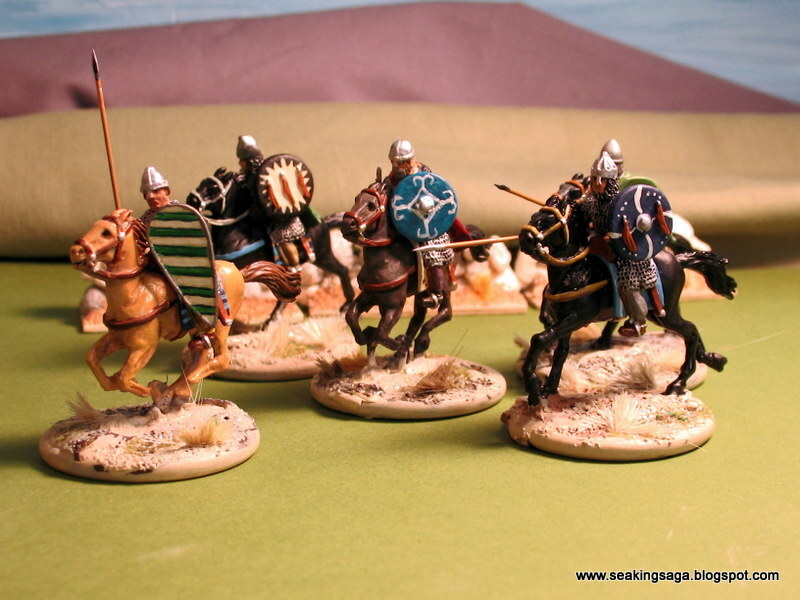 Historical opponents for an eleventh century Portuguese warband are plentiful and varied. Most obvious would be Andalusians and, later, the Almoravids. Equally prevalent as opponents was other Christian Iberians, or a combined Christian and Moorish force. While El Cid was a mercenary captain for the taifa city Zaragoza, he once fought off a raid that included the Count of Portugal. The Portuguese elite was equipped and fought like the rest of Iberia's Christians, wearing mail, armed with spear and sword and with horsemanship skills that rivaled the Normans. As a frontier region, Portugal was more more heavily influenced by Andalusian dress and military styles. Infantry was comprised of property owning men from towns and their lord's estates who saw war as an opportunity for adventure and plunder. 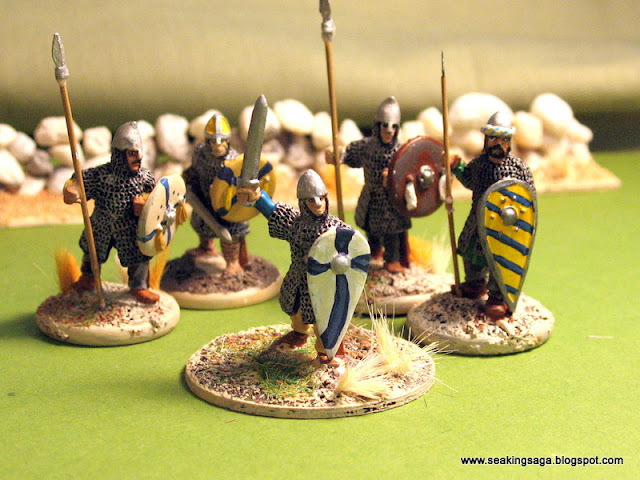 They were equipped with spear and sword, with the round shield giving way to the Norman kite shield later in the eleventh century. To defend against raids, peasant, especially those from shepherding backgrounds, were competent with the sling and javelin. 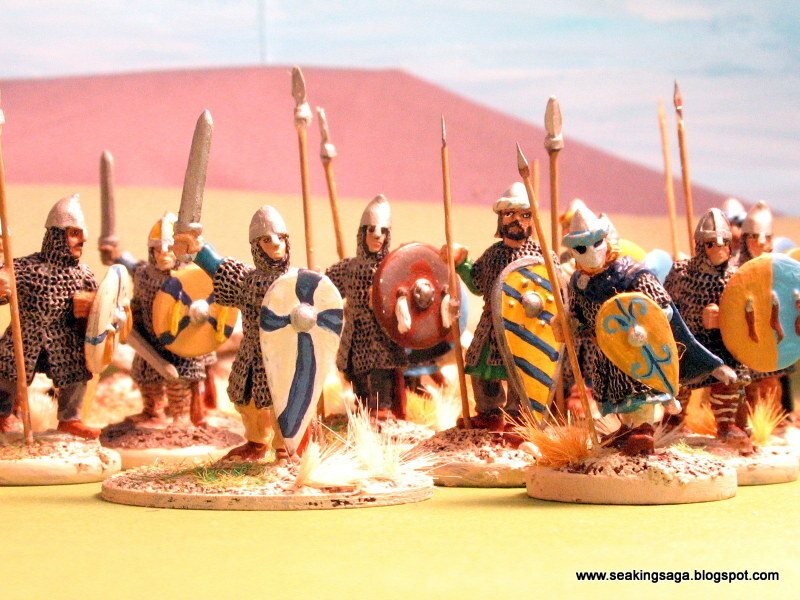 My next post will be a look at these skirmishers, and some historical fiction dealing with Reconquista Spain. Fletcher, Richard. 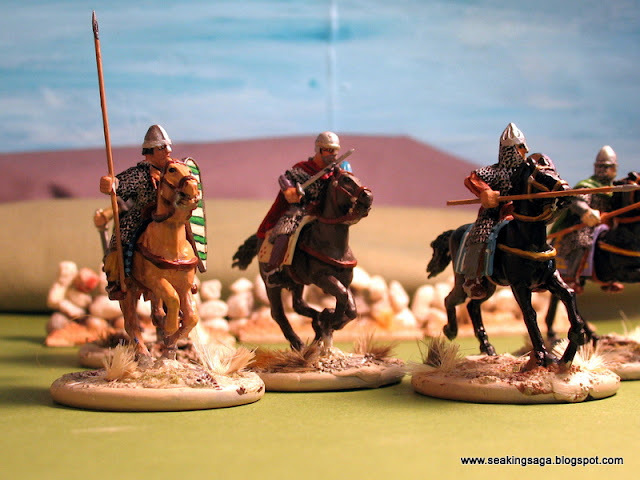 The Quest For El Cid. Oxford University Press, 1989. Luscombe, David and Jonathon Riley Smith, eds. The New Cambridge Medieval History vol. IV c.1024 - c.1198 Part II. Cambridge University Press, 2008. Nicolle, David. El Cid and the Reconquista 1050-1492. Osprey, 1988. Maps from Wikipedia used under Creative Commons license.